I'm Jack Lang, sheriff and former Navy pilot. To say Destiny was not what I expected would be like saying Wolverine's fingernails were long enough for a manicure. I'd been looking for Mayberry, a quaint little safe town to raise my daughter. That ship sailed when I met Tempest Pomeroy, who turned out to be a storm witch with a djinni brother and an ex who was... hell, I don't know what he is. But I wasn't sure I could stay. I had a teenage daughter to consider. I'm Tempe Pomeroy, Tempestaerie, mail lady, and as Jack likes to say, trouble magnet. Isn't it just like a man to exit a relationship when he finds out a woman's got a few little secrets? Jack's finally investigating my little brother's disappearance but time is running out and our relationship's gone from attraction to suspicion, support to friendship, romance to oh-my-god-get-away-from-me revulsion. D.C. native, Livia Quinn, now lives and writes by the bayou in Louisiana. 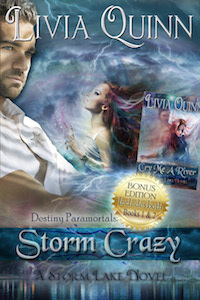 She's written ten books in her Storm Lake series, both paranormal and contemporary romance. While working as a plant manager, computer trainer, mail lady, professional singer, and small business owner she has stocked her brain full of great characters and fodder for her stories, and she can't wait to share them with her readers. Welcome back! I shared this on Twitter and Facebook, Pinterest and G+. Thanks so much, Kayelle. Appreciate your great site. Looking forward to seeing the new one.